Emotions are like the ocean and pain can be like a tsunami wave. It’s a collective bundle of grief, loss, sadness, hopelessness, frustration, gratitude. You can’t feel pain without knowing something is wrong. But like all feelings, pain is a messenger. When it comes, I like to lean in. Sometimes I am a witness, sometimes I am the mess. But I am in it all wholeheartedly. I don’t want to miss a single lesson pain has to whisper to me. Sometimes learning through loss is like a woman giving birth. The more you resist, the more painful labour can be. You have to open yourself in the very places your body tries to resist to be closer to birth. Pain is the pathway to growth because it shows us where something is wrong and gives us a chance to reset the bones. And pain is the pathway to healing too. 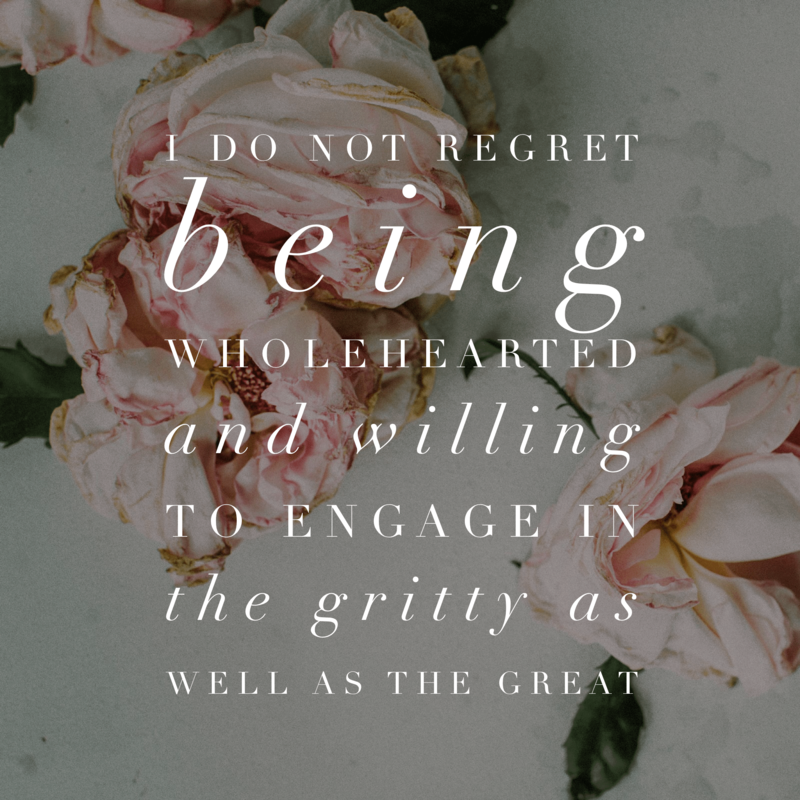 Therefore I do not, cannot regret being wholehearted and willing to engage in the gritty and the great aspects of life. I have an unfair advantage here – I’m wired to see this as the marrow of life, that authenticity and getting to the heart of any matter whether spiritual, intellectual or emotional will always be the place where truth empowers us to move forward. I go to the depths of the ocean all the time. It’s my playground. But don’t imagine for a minute that means pain is any less painful for me. No, it’s brutal and heart-wrenching and grinds my world to a halt. But if you get to know me, behind the layers and the writing and really get into my soul – if I let you in, there is a gift there beyond worth. It’s taken me a long time to believe it, but I see it now more clearly. I see things all day long and connect the patterns of the universe. I understand music and magic in ways you long for in your everyday life. I’ve learned to see joy and sorrow in the same breath. I am a seer. A seer of possibilities, a seer of truth and a seer of hopefulness. That’s why I long to help others learn to see. Not necessarily what I see – the depths of the ocean is often dark, but to see in their unique way. Many times in talking to someone, even strangers at a bar, we will end up in the depths of their dark wounds or the questions they wrestle with. I struggle with small talk, I’d rather peel back your layers and understand the real you. That means being prepared for the gritty. The bad ideas, the messiness of human living and relationships laid bare. Sometimes I am a witness, sometimes I am the mess. But I am in it all wholeheartedly. For me, there is no other way to be. There is no deep enough until we hit the ocean floors. Me, wholly myself celebrating you, wholly yourself. We spend so much time pretending to each other, when our healing is so often found in disclosing the vulnerabilities that allow us to see each other whole and hopeful. If we could do away with pretending, how much healing might we find in the world? But instead, we hide our true selves so often behind our fear of being seen for our messy selves. In our hiding we hurt each other, in our hiding we resist the pain of vulnerability and miss the gift of intimacy that comes from it. Yesterday I was given a good piece of advice, and because it’s never too soon to share what we learn, I’ll pass it on. In the midst of the pain, don’t lose your shape. Lean into your shape, the unique vocation of who you are. Your vocation isn’t a job but your calling on the earth. Mine is to bring wisdom and beauty into the world, through my stories and my experiences. So I have to write, share, talk, speak and show you what I see in the depths of the ocean. What I’ve learned looking into the depths of a thousand pairs of eyes, all hoping to found safe and sound so they can come out from their hiding places. So today, writer, heal thyself. Tell the truth of what you see. Remind yourself of the beauty in the world, the beauty in you. Remember what you sought in your youth – wisdom, understanding and grace before vanity. Remind yourself – your natural-born ability to emerge through pain and show beauty to others is your gift, your vocation and offering to the world. Remind yourself that your heart is bigger than oceans and you fear no feeling. When waves of unworthiness come, you plant your feet on ocean rocks and bathe until clean. You rejoice in joy and see that sorrow and joy grow best together. You are wholehearted like no other, you are a gift for those who need beauty and wisdom in the world.